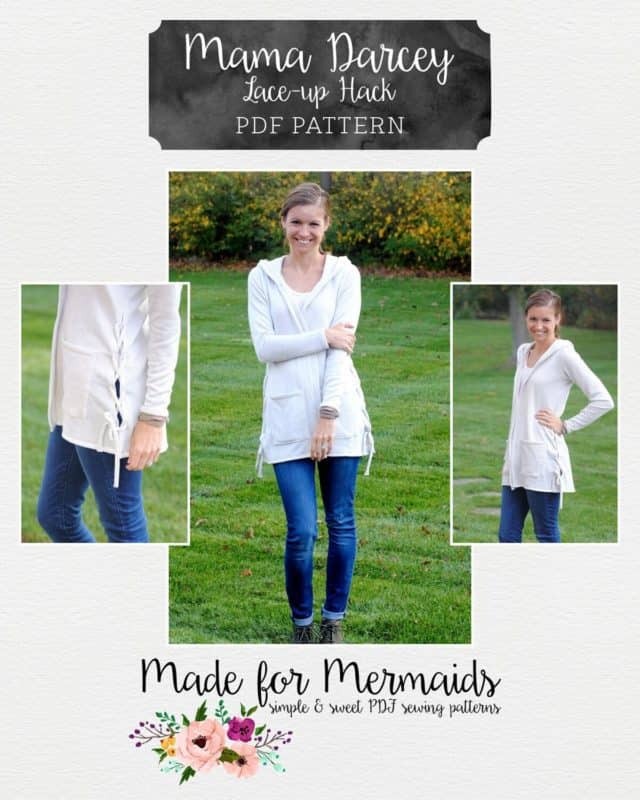 Our newest patterns have released and they’re amazing! 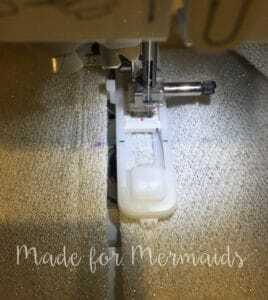 Mama Darcey, Darcey and even Dolly Darcey are so full of options but you know at Made for Mermaids we love our hacks! So we have included some great hacks for you here today! You can grab the Mama and girls Darcey on sale for $7/each and the Dolly Darcey for only $4.50 each. We also have two different LIMITED TIME BUNDLES to choose from! 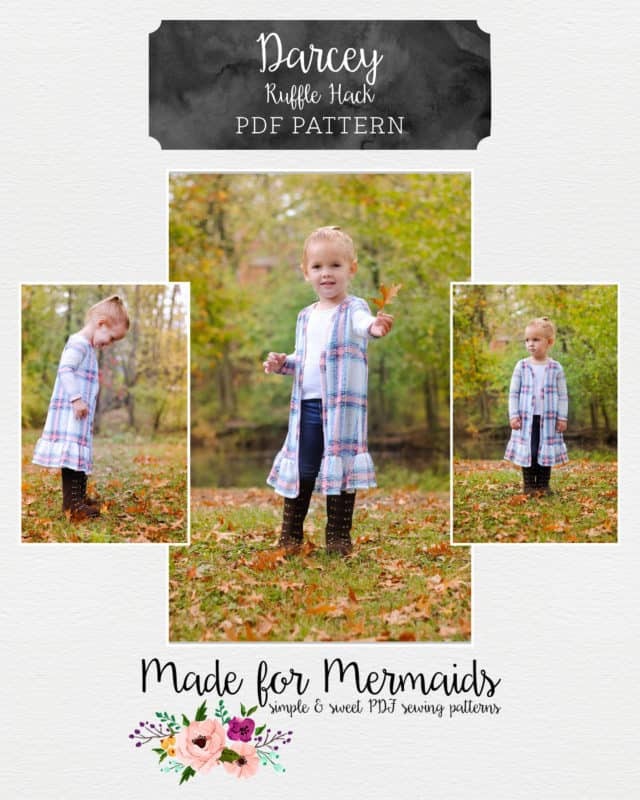 The first bundle includes the Mama and girl pattern for only $10! The second bundle includes all 3 Darcey patterns, dolly, girls and mama for only $13.50!! Sale and bundle deals end Saturday 10/28 midnight cst. Adding buttonholes is a fairly easy hack. 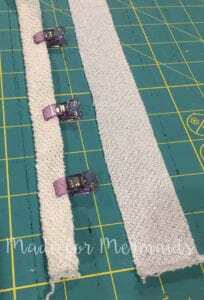 All you really need to do is add some stability to your band with some interfacing. 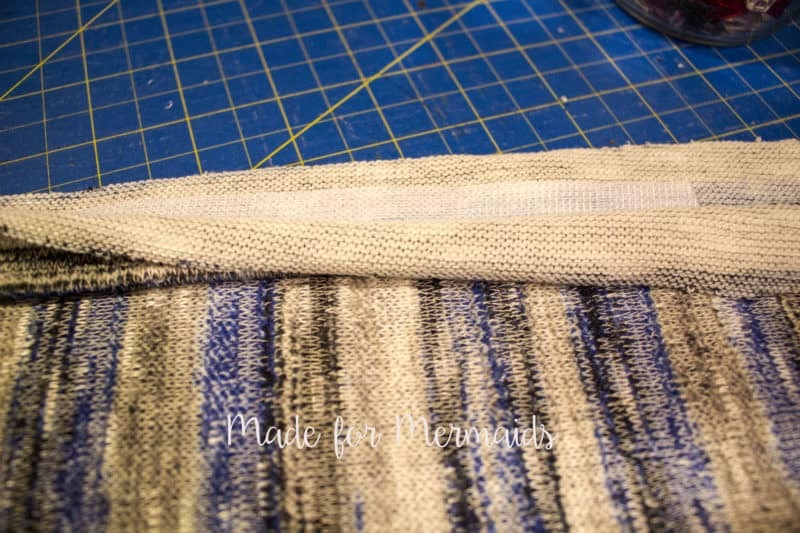 I like to just cut a long strip of interfacing and add it right into the band. I’m going to warn you now, my cutting mat is a bit of a mess, there has been a lot of Darcey Cardigan’s sewn and my cutting mat is covered in bits of sweater knit from cutting so just ignore all those bits of fuzz, I need to give it a good cleaning! First thing I do is measure wear I want my buttons. I’m using the hooded version for this one so I will start my buttons right at the top. I measure from there down to the bottom of the pattern removing about 2 inchs or so as I won’t have buttons right at the very bottom. 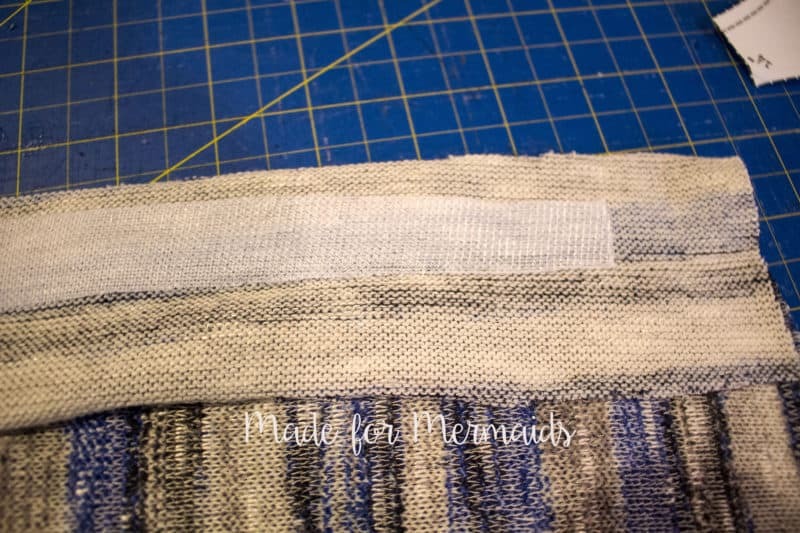 Now cut a strip of interfacing that length by .75 of a inch, if your interfacing is not long enough you can do it in pieces no one is going to see it anyways and you don’t have to be too precise either that interfacing is just to give it some stability. 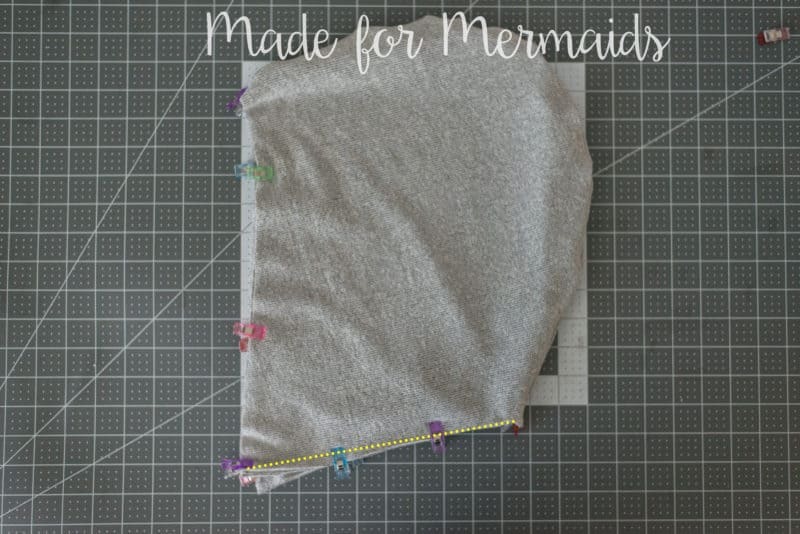 I use a knit interfacing that I buy off the bolt at my local fabric store. I’ve included a picture of it here. 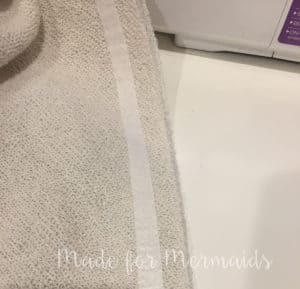 Grab your band that you have pressed in half and press you interfacing .5 of an inch away from the unfinished edge it should be right against the fold line on the wrong side of the fabric. Make sure that you have the interfacing on the side where your buttonholes are going to be. You want the interfacing to be on the top side of the band where you are going to sew those the buttonholes. I have the band on top of the cardigan here to make sure that I iron the interfacing on where it needs to be. Now you are going to attach you band making sure that the side of the band with the interfacing is right side together with your cardigan. Press you band after it is attached and now its time to sew those buttonholes. I like to start by marking where I want the top of my first buttonhole and then then the last buttonhole. I know that most people mark and sew them all in a row but I’m a rebel and like to sew the top and bottom one first and then I measure and center my other buttonholes in between. You can of course do whatever you like but I find that my buttonholes end up perfectly spaced if I do it this way. I just use pins to mark and then center them while I sew using my presser foot as a guide. Sweater knits don’t tend to take to marking pens very well so I just mark the top with a pin. You can try to draw marking on there but I haven’t found anything that works really well for this yet. 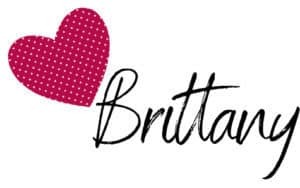 Now lets get real for a moment, buttonholes and sweater knits are not a winning combination, sewing buttonholes on knits can be stressful at the best of times but sweater knits are a particular pain. 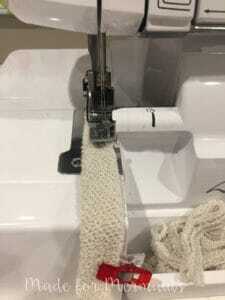 I find that although the interfacing helps a lot my machine tends to hate buttonholes on sweater knits the very most so I like to use something underneath to make the the feed dogs feed the fabric a bit easier. 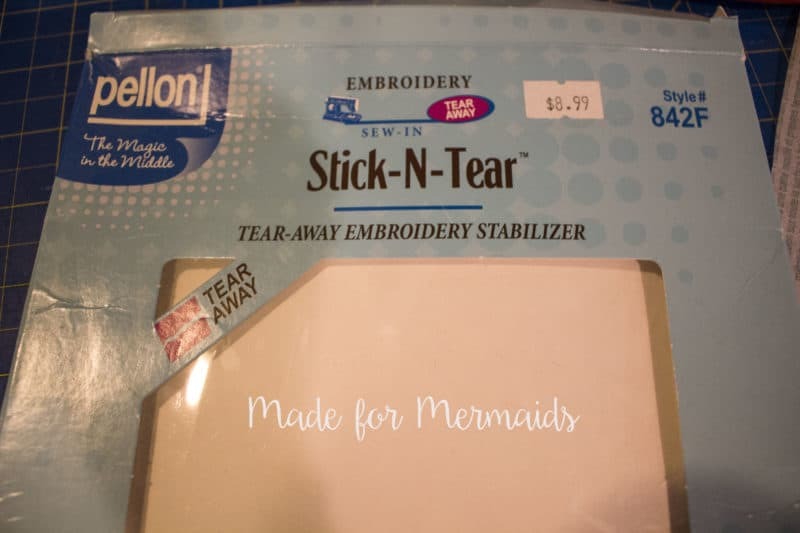 My solution is tear away embroidery backing. It feels like a cross between paper and interfacing and give the feed dogs just enough traction to feed the fabric through nicely. Tissue paper can also work in a pinch and when I can’t find either (yes my sewing area is that messy!) 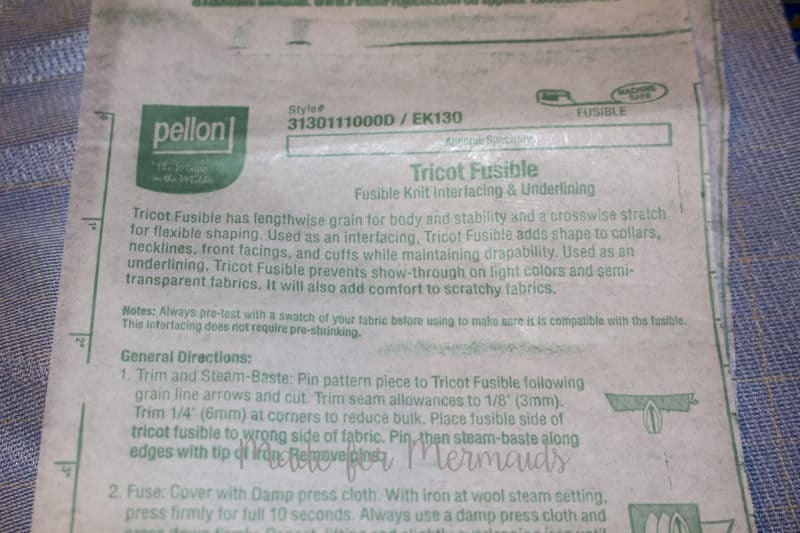 This is what I usually use but I was out of my tear away backing so I grabbed some parchment paper and used that, really anything to give those feed dogs some traction. Buttonholes are sewn with a really dense zig zag stitch and I find that my automatic buttonhole is a bit too dense of a stitch for a sweater knit so I adjust my settings just a bit, I bump the stitch length and width up just a bit. On my machine I just adjust each of the 2 setting up 2 but this is going to vary a lot depending on your machine. 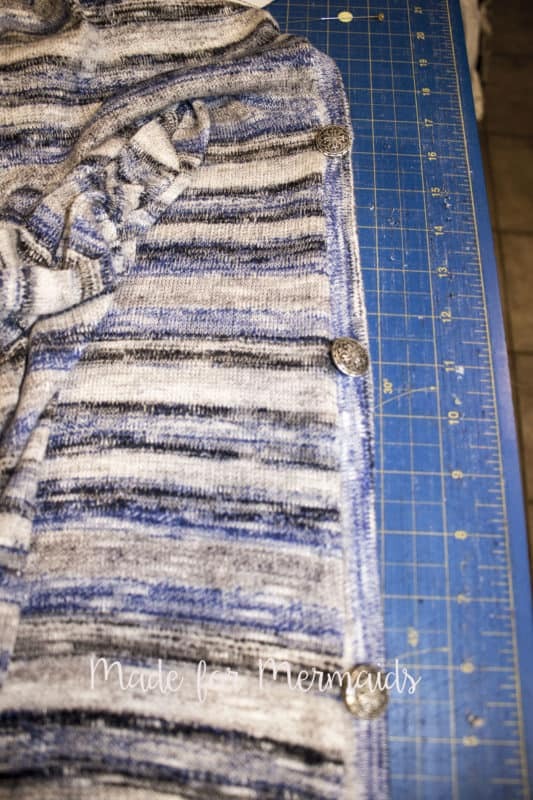 I always do a test buttonhole first on some scrap fabric to make sure the setting are good and it sews easily on the sweater knit that I’m using. 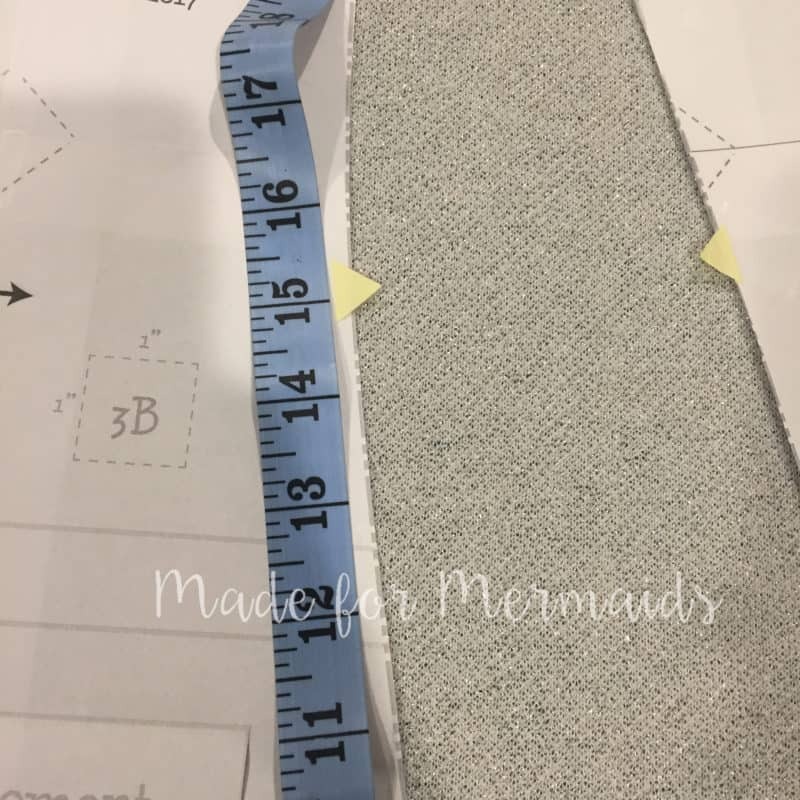 Once you have that first buttonhole sewn (If you don’t know how to sew a buttonhole check your manual as every machine is a bit different) I measure and mark exactly where I want my other buttonhole and then go ahead and sew them. To start I just throw my buttons on where I think they look good then I measure to make sure they are evenly placed. Once they are all sewn I use snips to cut my buttonholes open or my seam ripper. If you are using a seam ripper be really careful you don’t seam rip right through the buttonhole. Next up you want to mark and sew on your buttons, I always hand sew my buttons but again use your preferred method. I only used 4 buttonholes on this one for my daughter cause she most likely won’t ever even do them up but you can certainly add more so it doesn’t gape like mine do here, seeing as mine are more for decoration then function I wasn’t to worried. All done! A cute cardigan with buttons you can do up for those extra cold days! 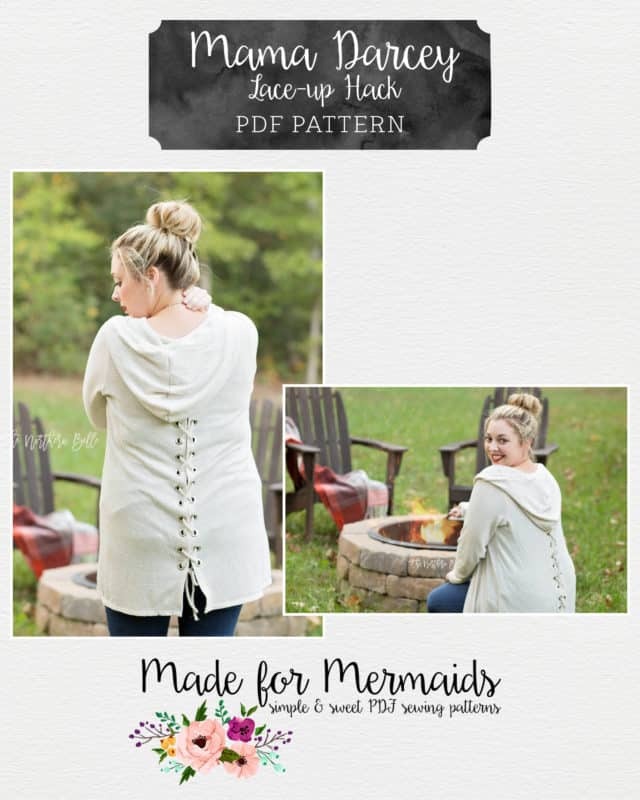 Want to make this cardigan even cozier?! 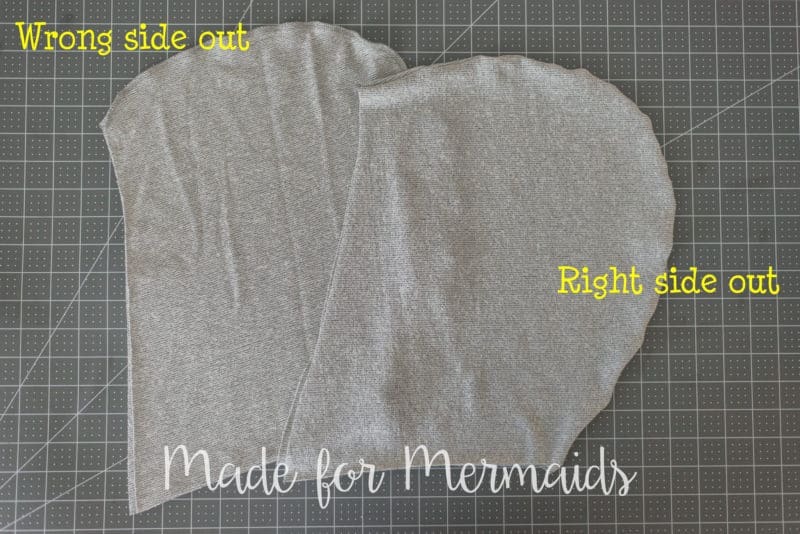 With this super simple hack, you can line the hood for added warmth, or just for aesthetic reasons. First, you will cut 4 hood pieces instead of the 2 instructed in the tutorial (2 sets of mirror images). 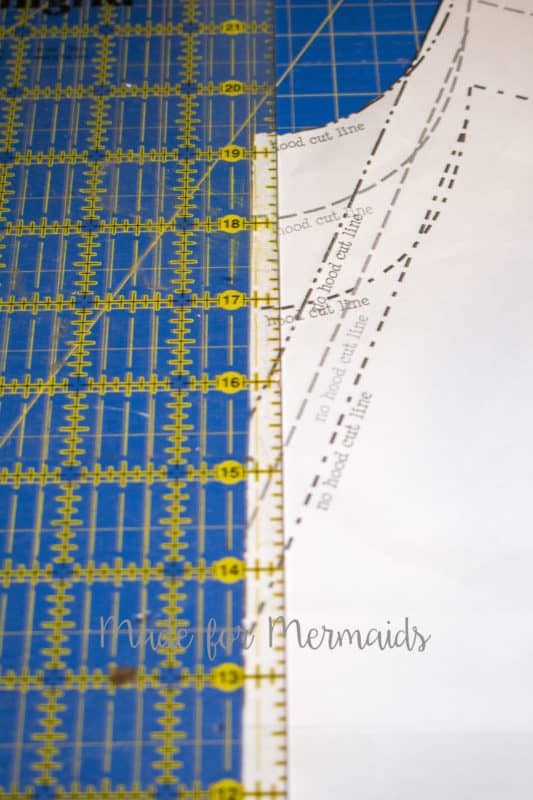 Next, you will place each set of mirror images right sides together and stitch along the curved edge, just as you are instructed in the tutorial. This will leave you with two hoods. Turn one right side out and leave the other wrong side out. Place one hood inside the other, wrong sides together. Your curved seams and raw edges should match, with all seams enclosed. Baste along all raw edges to keep hood pieces together. 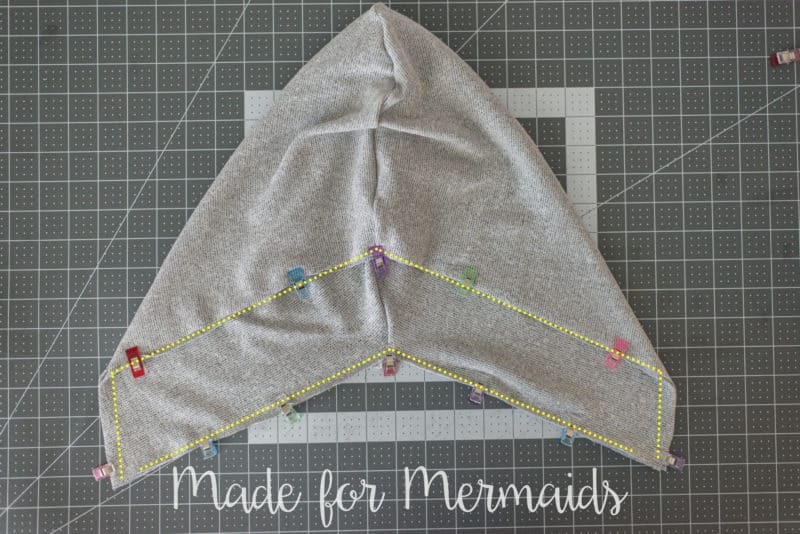 Continue to attach the hood and finish your cardigan as the tutorial instructs, treating the lined hood as one! Easiest hack ever, and it gives a beautiful finished product! 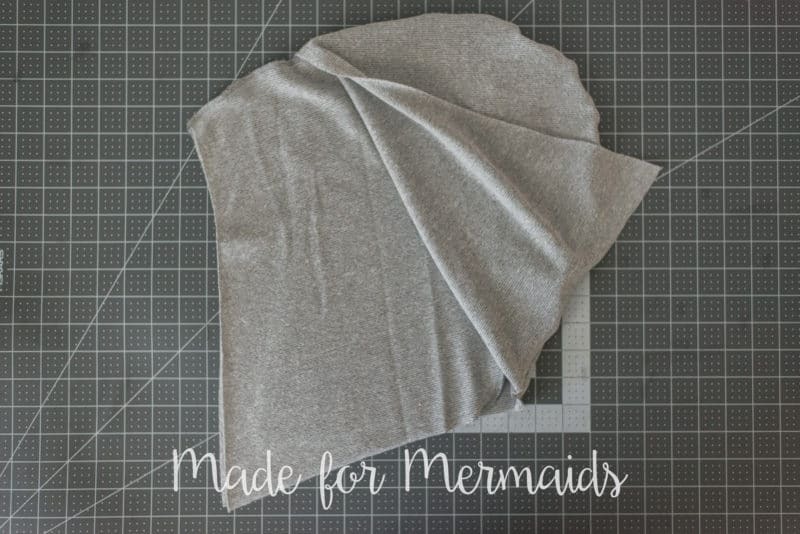 Here at Made for Mermaids, we love to give you lots of variety with tips and tricks to make your patterns even more versatile, and the new Darcey pattern is no exception! 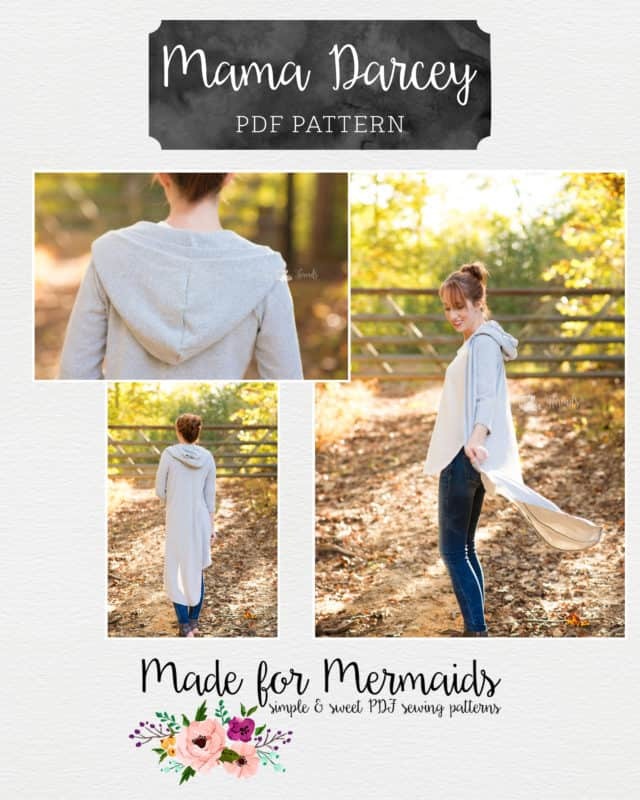 The Darcey pattern is amazingly fast to sew and it is packed full of options already. However, to make it a little more fun I am going to show you how I stitched up this Darcey version adding a super adorable ruffle. If you would like to make a Darcey with a ruffle too, it is super easy to do! 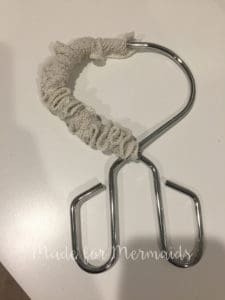 Just follow along with this blog post! 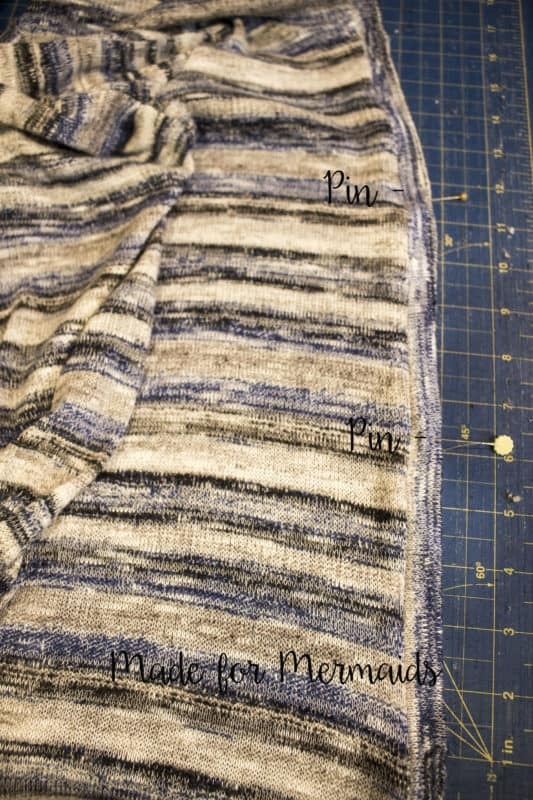 First start by assembling the pattern, you will want to glue or tape the entire length of the cardigan. 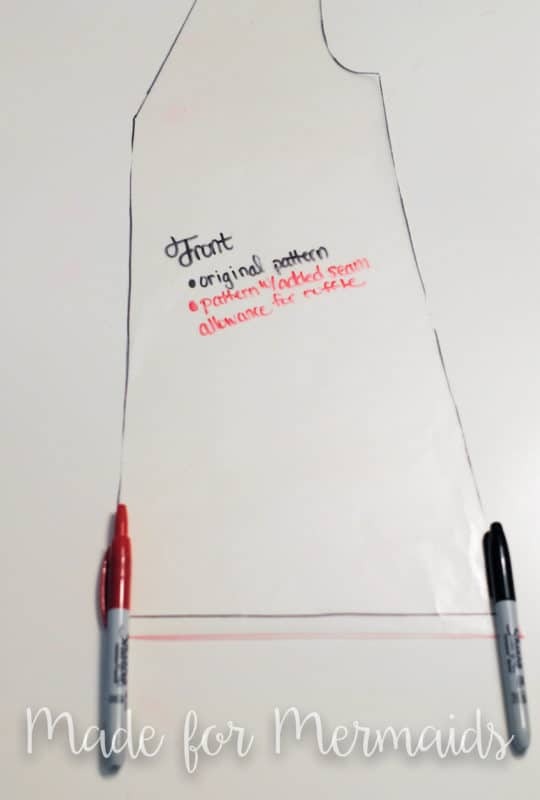 Then fold or trim the front and back pieces to the tunic cutline, add a .5″ to the tunic cutline to account for the new hem allowance. Use the duster cutting chart when choosing your band size. Measure the length from the tunic cutline to the duster cutline, this will give you the length of your ruffle. After you determine the length you will need to determine the width of the ruffle. 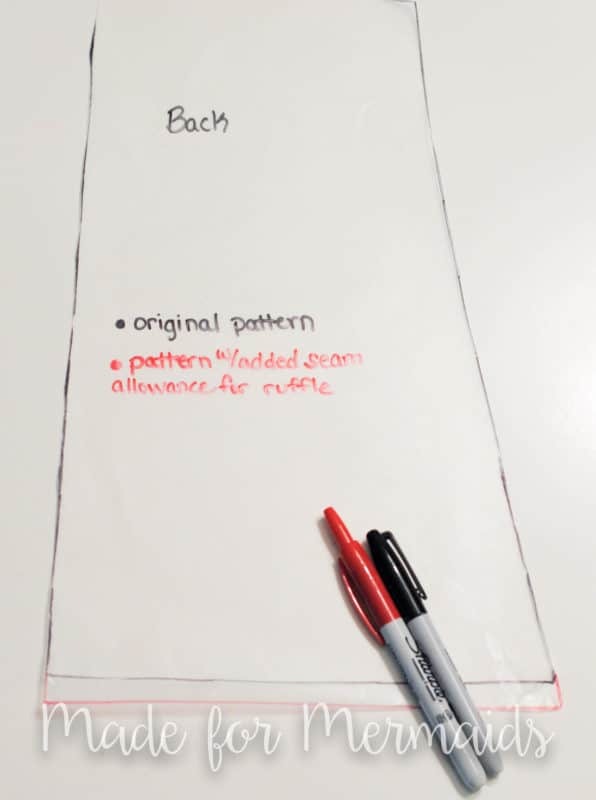 To find the width add the bottom measurements of the front pattern pieces then multiply that by two, and then do the same for the back pieces. You now have your width measurement. Note* you can reduce the width by multiplying by 1.5 instead of two if you would like ruffle to be a little less full. 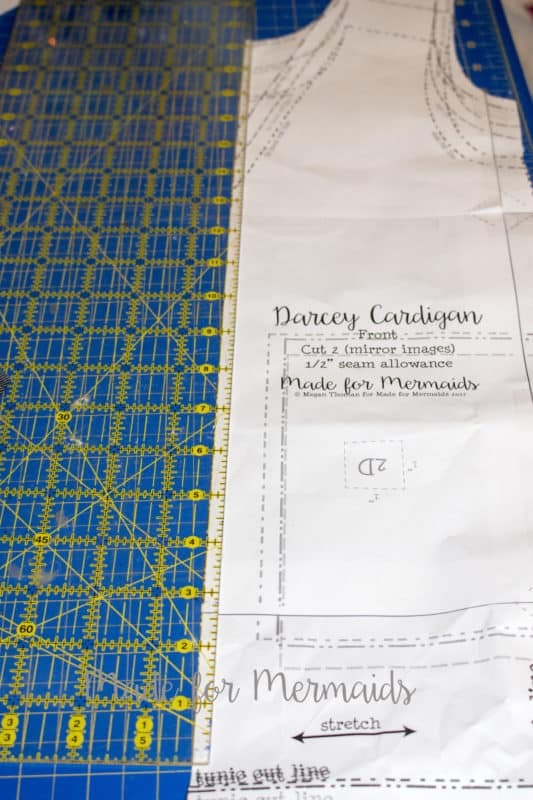 Follow the Darcey pattern until step 8. Before you attatch the band you will want to add the ruffle to the tunic hemline. To add the ruffle cut it according to the measurements we found above, then sew two lines of gathering stitches to the top of the ruffle piece. Gather the ruffle to match the width of the cardigan. Sew the ruffle to attach. Serge or finish the ruffle seam, and then contiune following the Darcey pattern. 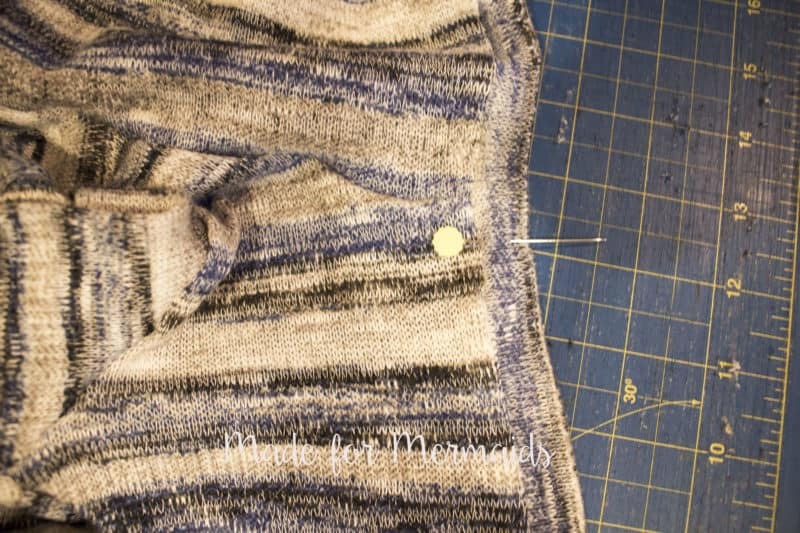 Be sure to attach the band to the ruffle short edge before hemming around the bottom of the cardigan. The hack to create the lace up sides or back, is very simple to re-create! 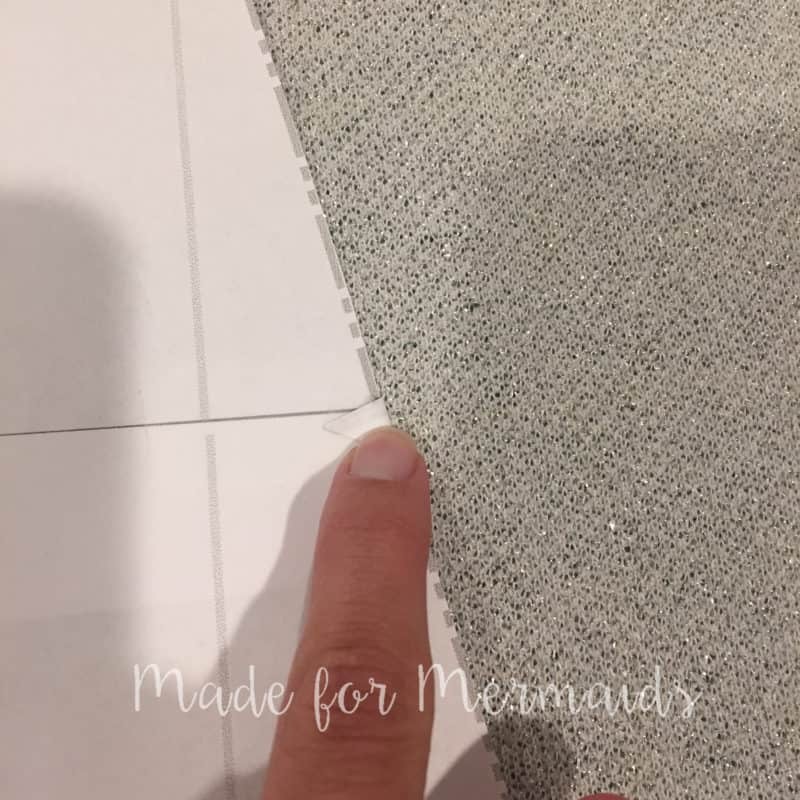 All it takes is extending the length of the side vent to your desired length, and adding some interfacing and then button holes or grommets to put your laces through! 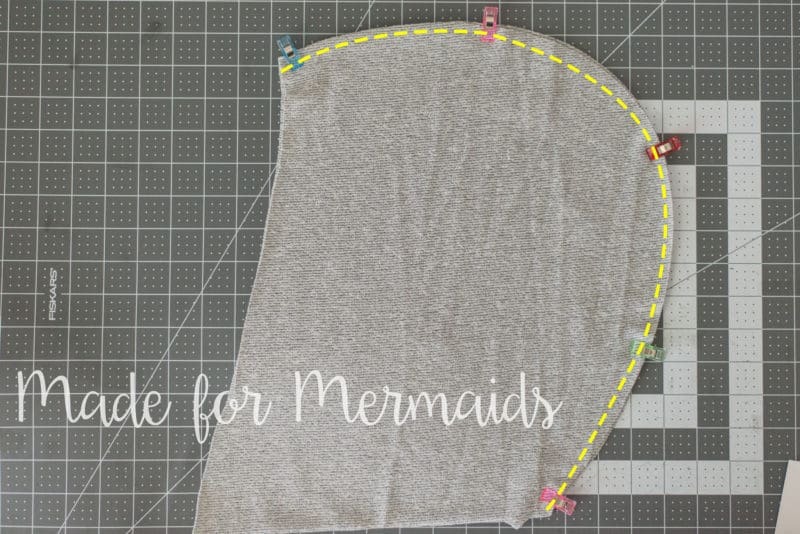 The first step for this hack is moving the notches on your pattern piece for the vents. I simply folded the original notches inwards and out of the way, and added some new notches higher up. I decided I wanted my vents to be about 15″ long, so I measured 15″ up from the bottom of the pattern piece and taped a couple new triangles of paper there to act as my new notches. I then cut out my pieces per the pattern, just being sure to keep my notches as I cut! If you are not using a pre-made tie for your laces, you will need to create them yourselves. 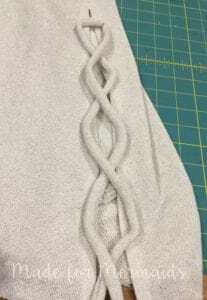 I wanted my laces to be from the same material as the rest of my sweater, but you can also easily use a pre-made cording, ribbon, or drawstring instead if you have something that coordinates! 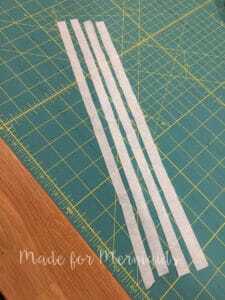 To make laces yourself, cut strips or fabric 1.5in wide by your necessary length. Mine ended up being 48″ long, which was perfect to lace through my 15″ vents and still have a little bit to tie a bow. If your vents are longer, you will need to make your laces longer! Serge of sew your laces right sides together, using a 1/4″ seam allowance. Once you have created your long narrow tube, turn it the right way with your preferred method. (I prefer my turning tool shown below!) Be sure to finish the ends of the laces! You will need to add interfacing along your vents to stabilize them when adding the button holes or grommets. I cut 4 strips of lightweight fusible interfacing that were each 1/2″ wide by about 14″ (which the length of my vent less 1/2″ hem allowance at the bottom and 1/2 allowance at the top of the vent to reduce bulk there) Because I was going to be doing buttonholes from the right side of my sweater, and I wanted the right side to be stabilized for that, I placed my interfacing 1/2″ in from the edge and ironed it on. I then finished my vents and bottom hem per the pattern before moving on to adding my button holes. To work out proper placement of my buttonholes, I laid one of my laces on top of one of my vents and moved the lace around to different configurations before decided on the look I liked. I ended up with the placement shown in the picture, which would require 8 buttonholes on each vent, spaced about 3″ apart, and starting about 1″ down from the top of the vent. I carefully measured and marked for each button hole before moving over to my machine and sewing the button holes. 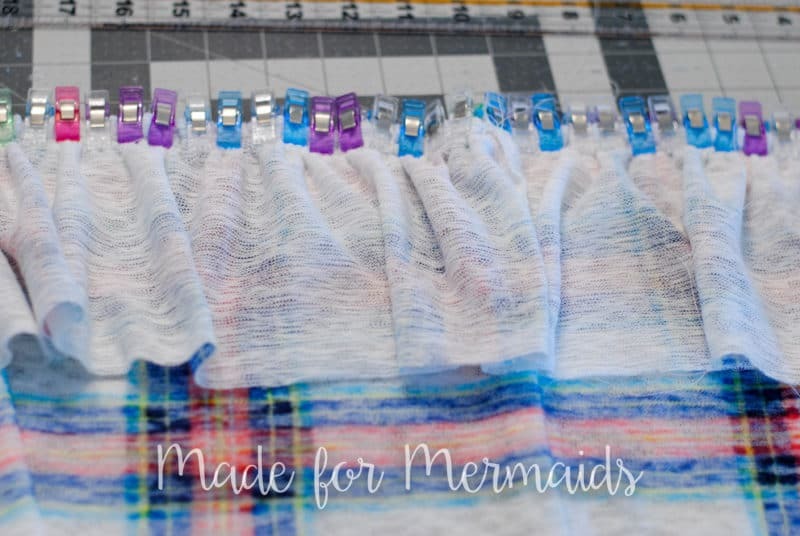 Be sure you use a thread that coordinates or matches your fabric! Also, remember that you can opt to add grommets at this step instead of buttonholes if you want a different look! Slide your laces through the buttonholes or grommets, tie a bow at the bottom, and you are all finished! For the lace-up back, you will use the exact same process. Determine how long you want your back opening. Iron interfacing along each long side of the back piece (I used tricot fusible interfacing like Angela used above). Create your “back vent” just like you are directed in the tutorial. The only difference is, your back vent will be much longer. 🙂 Add grommets or button holes and lace up the back with cording, ribbon, twill tape, or self-made laces. All of these hacks can be used on either the girls or mama version! 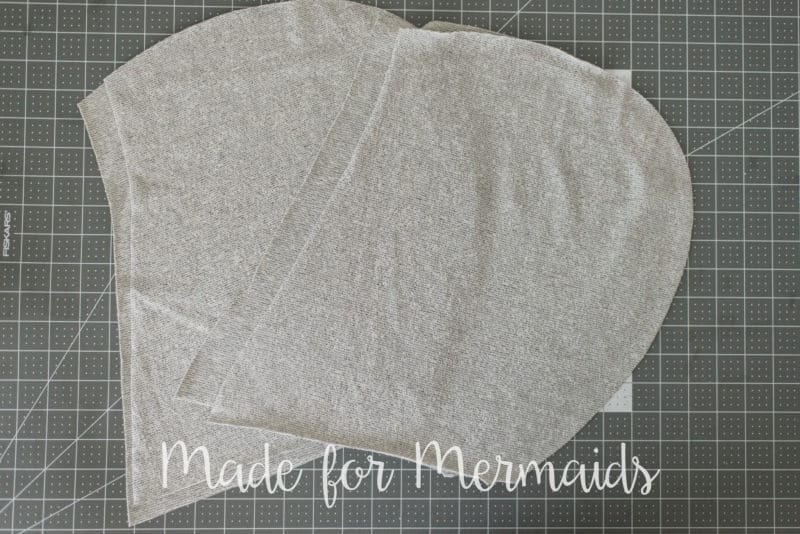 Don’t forget to share your Darcey hacks with us in the Made for Mermaids Patterns Group page on Facebook or on Instagram. We love to see what you’ve created!